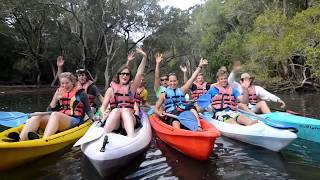 Byron Bay Eco Cruises & Kayaks operates award-winning cruises and kayaking tours of the beautiful Brunswick River, just 15 minutes’ drive from Byron Bay, a popular holiday destination on the North Coast of NSW. The river is in the Cape Byron Marine Park. You’ll have close encounters with abundant marine life, birds and other wildlife, and enjoy commentary on the area’s history, environment and culture. The accredited ecotourism operator offers a 90-minute river cruise that includes local coffee and delicious cakes, a three-hour tour incorporating the river cruise, guided kayaking and stand-up paddleboarding, or the three-hour Eco Guided Kayak Tour, a kayaking only experience. A courtesy bus provides return transport between Byron Bay and the Brunswick River. In Byron Bay, you can also enjoy a two-hour Byron Easy Lighthouse Tour and a full-day tour of the Byron Bay region. The river cruise operates with a maximum of 12 passengers, departing from the Boat House at Brunswick Heads, opposite the fish and chip shop. It operates Monday, Tuesday, Thursday and Friday, from 10am to 11.30am. You can also enjoy glorious sunset cruises.